Capturing dust is no easy game. Numerous factors come into play when designing a dust collection system. To be successful, a baghouse must be properly designed with the right filter material, ductwork, and capture system. Flows and velocities have to be correct to ensure proper transference of the dust to the baghouse. And sometimes, the odds are against us in capturing the dust because of the basic principles of nature and physics with respect to the particle size of the dust. Specifically, capturing dust in the submicron range, specifically the 0.5 to 0.1 µm range is difficult, and a prime example of this problem of nature and physics. Anybody aware of the EPA Air Quality Standard for PM2.5 and PM10 knows the answer. Particles 10µ and smaller are easily inhalable, and because these microscopic solids are so small, they can cause serious health problems. The reason that particles less than 10 µm in diameter pose great problems is because they can get deep into our lungs, and once in the lungs, may even get into your bloodstream. The finer particles (PM2.5) are the main cause of reduced visibility (haze) and what we call visible air pollution. Particles within this size range size range are able to travel deeply into the respiratory tract, reaching the lungs. Exposure to fine particles can cause short-term health effects such as eye, nose, throat, and lung irritation, coughing, sneezing, runny nose, and shortness of breath. Exposure can also affect lung function and worsen medical conditions like asthma and heart disease. Scientific studies have linked increased daily PM2.5 exposure with increased respiratory and cardiovascular hospital admissions, emergency department visits and deaths. Studies also suggest that long-term exposure to fine particulate matter may be associated with increased rates of chronic bronchitis, reduced lung function, and increased mortality from lung cancer and heart disease. People with breathing and heart problems, children and the elderly can be particularly sensitive to PM2.5. Why the concern with Submicron Particulate Matter? Dust in the 0.1 to 0.5 micron range is the hardest dust to capture. It can migrate through filter materials. It can seep through the stitching on a dust filter and make its way to the clean air side of a dust collector and make its way into the environment. * Interception takes place when a contaminant particle passes within the distance equal to one particle's radius of a filter fiber, resulting in it touching the fiber and being removed from the airflow. Particles further than one particle radius from a fiber will not be trapped. 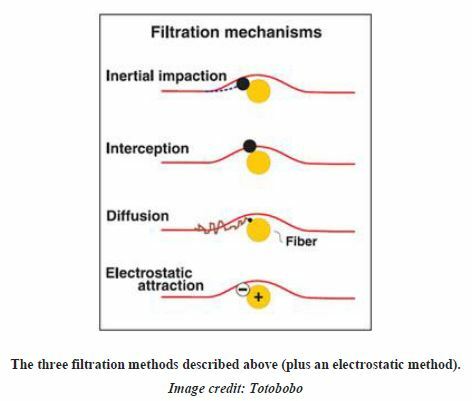 * Inertial impaction occurs when a large particle, unable to adjust to the change in air direction near a filter fiber, becomes trapped on the fiber. The particle's inertia ensures that it continues along its original path instead of circumventing the fiber, resulting in its capture. * Diffusion relies on the Brownian motion of gas particles. Small particles (typically 0.1 µm or less) tend to travel on a streamline in an erratic fashion, making random motions as they interact with gas molecules. This erratic motion causes the contaminant particles to become stuck to filter fibers. Understanding these three methods makes it clear why particles around 0.3 (0.1 to 0.5) micrometers are most difficult to filter. Particles less than 0.1 micrometers are easily trapped due to diffusion while particles larger than 0.4 micrometers are trapped by inertial impaction. Particles between 0.1 and 0.4 µm are therefore too large for effective diffusion and too small for inertial impaction and efficient interception. The dust collector and its filter's efficiency drops within this range. It is also the reason the body can’t filter these particles. Can We Improve Performance? The Answer is Yes! It is easy to point out problems and state that submicron dust in the 0.1 to 0.5 µm range is extremely difficult to capture. It is a much harder task to offer a solution. Fortunately, filter fabric and filter designers continue to work diligently to improve performance and to find solutions to the problem of capturing submicron dust. Today’s state-of-the-art filters use advanced filter materials with special treatments or are combined with membranes to improve performance. And, new manufacturing processes have been adopted as well. One of the most effective means of capturing submicron particulate matter is the use of a PTFE membrane on top of the filter material. With a PTFE membrane, capture efficiencies increase all the way down to 0.1 µm. Dust 0.1 µm and smaller are captured efficiently by diffusion. The PTFE membrane gets us through the troublesome range of 0.1 to 0.5 µm. How does the PTFE membrane improve performance? The PTFE membrane laminated on top of the filter material results in a greatly reduced pore size as compared to the original filter material. The pore size is small with an average diameter around 2.3µm, yet the porosity remains high. The end result is highly effective surface filtering. Preferred materials for efficient capture include polyester, spunbond polyester, and Ryton. Why? These materials can be heated and the material fused together. Do you recall the problem mentioned earlier about submicron dust being able to seep through the stitching on a filter? Fusing the material along the stitching eliminates the stitch holes and the access path through the filter. The PTFE membrane is precisely removed from the filter along stitch line and the filter material is meticulously fused together. Where fusing is not practical, silicon is used to seal any potential escape pathway for the dust. Dust collection is part science and part art. Dust collection solutions are derived by theoretical and empirical means. 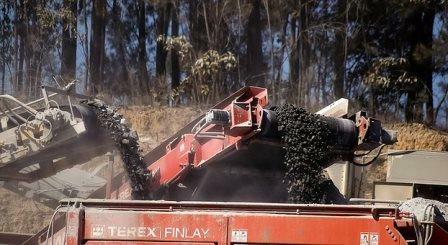 Experience often is the best teacher on what works and what does not work for a particular dust collection application. Science and the medical profession has alerted us to the need to keep our environment free from dust. The health hazards of breathing dust are many and this is especially true of easily inhalable dust in the size range or 10 µm and smaller. Capturing dust in this range is important for everyone. Today, improvements in filter materials and filter manufacturing techniques have greatly improved our capabilities of capturing the particulate matter (dust) of concern to the EPA as detailed in the EPA Air Quality Standard for PM2.5 and PM10. Fortunately, the use of membranes like PTFE and fusible filter materials has greatly enhanced performance in this critical range. 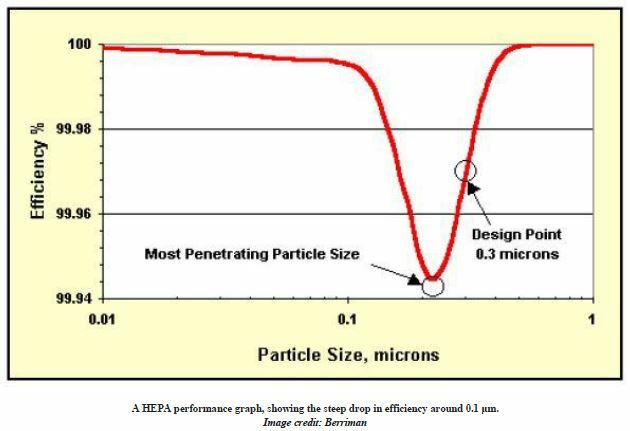 If the particle size distribution of your dust includes particles 10 µm and smaller, employ filters using the advances discussed in this article. It will do everyone and the environment a favor. Mike Ryan is VP & GM, Griffin Filters, Liverpool, NY. For more information, visit www.griffinfilters.com.